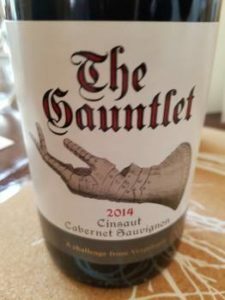 The Gauntlet Cabernet Sauvignon Cinsaut 2014 is billed as “a challenge from Vergelegen” and no prizes for guessing who winemaker André van Rensberg might be wishing to engage. WO Swartland, it’s a blend of 60% Cabernet Sauvignon, 31% Cinsaut and 9% Zinfandel, matured for 10 months in old oak. Aromatically, the wine shows black cherry, some floral character and fresh herbs. On the palate, it’s sweet fruited with fresh acidity before a spicy finish. Delish and great bang for your buck at R85 a bottle. Not only a gauntlet, but it looks to me like the one finger of the gauntlet on the label is suggestively raised. A rude gesture as well as a challenge!? Incidentally, if cab is in the majority, then the name should be as you have it, Cabernet Sauvignon Cinsaut, rather than the “Cinsaut Cabernet Sauvignon” on the label.